Breakthrough new stereomicroscope optics deliver the world’s highest zoom ratio of 25:1, higher resolution and brighter fluorescence images. Nikon’s SMZ25 stereomicroscope combines macro and micro imaging in one instrument for convenient viewing and manipulation of single cells to whole organisms. Using Nikon’s Perfect Zoom System optical technology, the SMZ25 achieves the world’s first 25:1 zoom and high NA for superior resolution never before seen with a stereomicroscope. Using these innovative optics and a fly-eye lens, crystal clear fluorescent images with improved S/N ratios are possible, even in low-excitation light applications such as cell division. Additionally, even at low magnifications, the SMZ25 has a 35mm F.O.V, allowing users to capture an entire 35mm dish with uniform brightness. A breakthrough in stereomicroscope design, the SMZ25’s Perfect Zoom System dynamically changes the distance between the two optical axes as the zoom factor varies. This change in optical axis distance enables maximization of light entry into the optical system at every magnification. The result is a large zoom range, high resolution in both eye-paths, and minimal aberrations over the entire zoom range..
Nikon’s exclusive Perfect Zoom System provides the world’s first zoom ratio of 25:1 (zoom range: 0.63x – 15.75x*). Even with a 1x objective lens, the SMZ25 captures the entire 35mm dish and simultaneously delivers microscopic details. The SMZ25’s exclusive Auto Link Zoom (ALZ) automatically adjusts the zoom factor to maintain the same field of view when switching objective lenses. This function enables seamless switching between whole organism imaging at low magnifications and detailed imaging at high magnifications. Live zebrafish expressing GFP- and RFP-neurons, imaged with Nikon’s SMZ25 (fluorescence and OCC). Image courtesy of Joe Fetcho, Ph.D., Cornell University. Even at low magnification, the SMZ25 captures an entire 35mm dish with equal brightness over the whole field of view, making it ideal for live screening of developmental models such as C.elegans,Drosophila, zebrafish, and mice to identify and select mutants. The SMZ25 combines fly-eye technology, which uniformly illuminates the entire field of view, and a high S/N ratio along with increased transmission for incredibly bright fluorescence, even at low magnifications. This also minimizes photobleaching and phototoxicity, thus reducing harm to live cells and organisms. 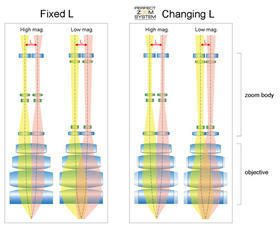 Nikon’s newly developed optical system offers a drastic improvement in S/N ratio even at high magnifications. 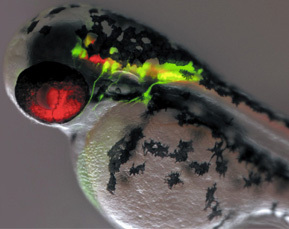 Time-lapse imaging of developing C. elegans embryos expressing RFP-histones and GFP-membrane markers allows researchers to screen for cytokinesis mutants prior to selection for downstream applications C. elegans embryos (GFP and RFP; each ovoid is ø30μm in diameter) (using SHR Plan Apo 2x at zoom magnification of 8x with SMZ25) Image courtesy of Julie C. Canman, Ph.D., Columbia University. 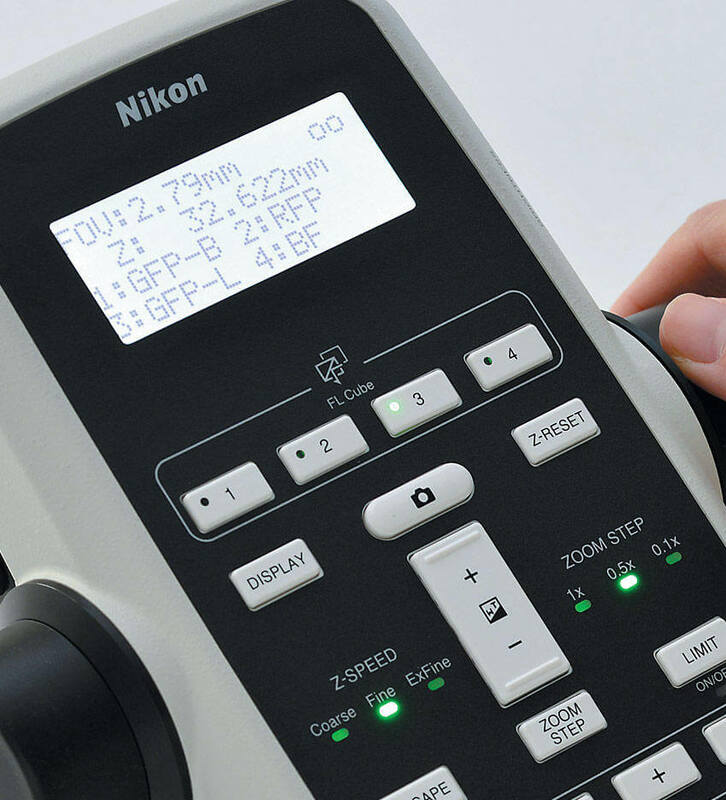 Easily switch between stereo position (stereoscopic view) and mono position (on-axis view) when using the P2-RNI2 Intelligent Nosepiece by simply sliding the objective lens. Digital images with uncompromised clarity can be captured using the mono position. The all-new controller provides easy access to zoom and focus controls and is designed for both right- and left-hand use. The remote controller contains an LCD monitor with an adjustable backlight which provides information regarding the zoom factor, objective lens, filter cube, and LED DIA brightness at a glance. 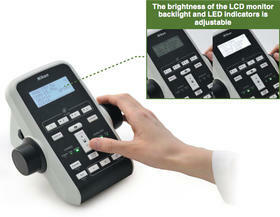 The backlight on the LCD monitor can also be turned off to eliminate interference with low-light imaging applications. In addition to the remote controller, the microscope can also be operated through a PC. Nikon’s flagship, cross-platform imaging, software can now be used with Nikon’s newest stereomicroscope systems. NIS-Elements enables a wide range of advanced digital imaging capabilities, easily from a PC. The DS-L3 is an easy-to-use high-definition, large touch-panel monitor that can be used to quickly capture images without a PC.